After "just" finishing watching the last season of Robot Chicken on DVD, I thought that it would be impossible to go beyond the political incorrectness and offensive humour of this series but I was wrong. 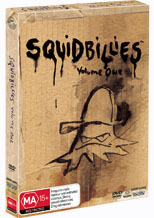 By the way, Robot Chicken was one of the funniest shows that I have ever watched and Squidbillies Volume 1 may just be a close second. From the minds of Adult Swim, come the Squidbillies that is a tale about some southern inbred squids who happen to live in the hills of North Georgia and contains every redneck stereotype possible. Featuring "Early" Cuyler as a redneck ex-con hillbilly who has just been released from prison, he is finally reunited with his illegitimate son as the duo meet the rest of their "clan". The entire cast of characters is crazy and if you get easily offended by politically incorrect humour then you had better stay clear of this exceptional cartoon series. The only drawback of the series is the strange animation of the series that actually suits the series perfectly. Definitely recommended to the pop culture lover! Featurette: "How I Make The Damn Show!"